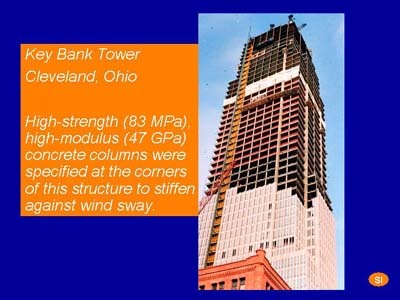 For this 57-story high-rise structure in downtown Cleveland, the engineer specified a concrete with a compressive strength of 83 MPa and a modulus of elasticity of 47 GPa. This very high modulus was necessary to stiffen the structure against sway caused by wind from nearby Lake Erie. The high modulus was achieved using local aggregates in a concrete with an average compressive strength at 56 days over 104 MPa. The concrete for this structure contained a combination of portland cement, blast furnace slag, and silica fume. The water-cementitious materials ratio was 0.24. A combination of chemical admixtures was used to produce a minimum slump of 250 mm.